Temperature control is key for good BBQ. When you’re smoking meat, you need to monitor both the temperature of your smoker and the meat(s) you’re cooking. There are a ton of products available for getting the job done, and this article will cover our top five choices to help you choose the best smoker thermometer for your needs. We’ll also go over what you’ll want to consider before purchasing a thermometer for your smoker. In our #1 spot is ThermoPro’s TP20 Wireless Thermometer. It has a dual probe design and provides amazing wireless range and accuracy. The Tenergy Solis allows you to track up to six probes at once – that’s the most of any thermometer on our list! If you just need a single probe wireless thermometer that provides a long range, the ThermoPro TP07 is a great choice. Weber’s iGrill 2 uses Bluetooth and a polished app to let you wirelessly track your meat, and it accommodates up to four probes. If you’re not concerned with continually monitoring the temperature of your meat and/or smoker, then you can user Mister Chefer’s simple digital thermometer to get an instant reading of your meat whenever necessary. Probe capacity is the first thing you’ll want to think about. If your smoker displays the inside temperature and you just need to monitor the temp on one piece of meat, then a single probe thermometer will work for you. On the other other end of the spectrum there are folks who need to keep tabs on the smoker’s chamber along with several pieces of meat. If that’s you, don’t fret – there are four and even six probe models available. I personally find that the happy medium that works for me is two probes. If you want to watch the game and never miss a play, make sure your thermometer can provide an accommodating range. And if you don’t mind the extra exercise, you could just use the simplest option in our list: an instant thermometer. You won’t be able to continually monitor temperatures, but if you don’t mind probing your meat each time you need to get a temp, then an instant thermometer can provide great value. Your thermometer will be exposed to high temperatures and possibly harsh weather conditions from time to time, so it’s important to choose one with a good warranty. The warranty of the thermometers on this list vary, but they all have at least 1 year warranties. Note that some brands will extend your warranty if you take the time to register your product, so be sure to take a look at your thermometer’s official warranty. 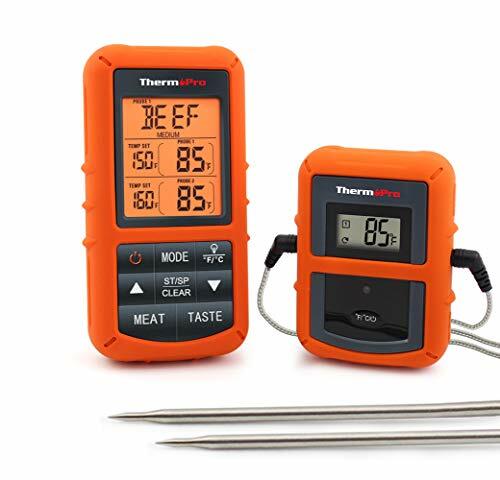 Coming in first place on our list is ThermoPro’s TP20, which is a wireless, dual probe thermometer. This digital thermometer has two main parts: the transmitter and receiver. You plug the two probes into the transmitter, which stays near your smoker. Then you can take the receiver anywhere you want, so long as it’s within 300 feet of the transmitter. The TP20 is super easy to use right out of the box. There’s no need to sync the receiver and transmitter or go through any other confusing setup steps – it’s ready to go once batteries are inserted. It comes pre-programmed with USDA recommended temperatures for various proteins. And it even has USDA doneness levels for different meats, so if you want to cook your beef to medium rare, it’s got you covered. There are two ways the TP20 can alert you that your meat is finished. You can set a traditional timer for a certain amount of time, or you can set an alarm to go off when your meat reaches a certain temperature. The receiver is splash-proof and comes with a stand and belt clip. The transmitter comes with a wire that can either be used as a stand or hooked to your smoker. And if you’re barbecuing into the night, the backlit LCD display makes the receiver easy to read. If you’re wondering about the small piece of metal that is visible in the product photograph, it’s a probe holder that clips into grill grates (or an oven rack). You slide the probe through the holes so that it can be suspended in air – this will give you an accurate ambient temperature reading. The great wireless range, accurate readings, easy setup, and dual probes included with this ThermoPro model make it our best smoker thermometer. The six probe capacity of this Tenergy Solis digital thermometer sets it apart from the competition. If you cook for crowds and find yourself smoking multiple briskets or pork butts at the same time, then this is likely the best smoker thermometer for you. This Tenergy thermometer is wireless with a range of 100 feet. While that’s less than the range of the ThermoPro models in this list, it’s still a considerable distance that will work for most people. And if connection is lost, an alarm will alert you so that you don’t overcook your meat. Another difference from the ThermoPro thermometers is that this Tenergy model uses Bluetooth to communicate with your phone rather than having a dedicated receiver. This means you will have to download the app, which is available from both the App Store and Google Play. The app comes with pre-set temperature targets for various types of meat and doneness levels, or you can set your own. Each probe can have its own target temperature, and you’ll receive instant notifications on your phone when your meat is ready! The transmitter is relatively small with a backlit LCD display. It has a magnetic back, so if your grill or smoker has some metal that doesn’t get too hot, you can stick the thermometer right to it – or slap it on your refrigerator when you’re not using it. One nice thing about the probes is that they have silicone handles. These are a lot easier to grab and maneuver than probes that are just stainless steel alone, and they lower your chances of getting a burn. And if they ever stop working, Tenergy offers free lifetime probe replacement. You can think of the ThermoPro TP07 as the little brother of our top choice, the TP20. It is very similar in design, but this model only has a single probe. If you’re just wanting to monitor the ambient temperature of your smoker or a single piece of meat, then this is the thermometer for you. Like the TP20, the TP07 is very easy to set up. You won’t have to waste any time syncing the transmitter and receiver. Just insert the included batteries and you’re good to go – from as far as 300 feet away! 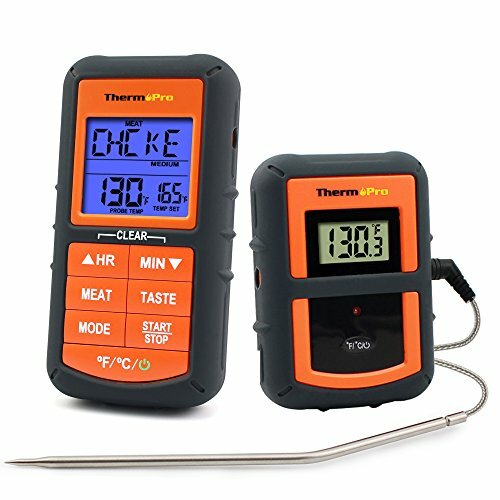 Like other thermometers in this list, the TP07 is programmed with temperature targets for doneness levels of various meats, such as beef, chicken, and pork, among others – and you have the power to reprogram those presets if you wish. One unique and useful feature of the TP07 is that the backlit LCD actually changes color to represent changes in temperature. The first color is blue when the temperature increases 10 degrees. Then the LCD backlight changes to green when the temperature reaches within 15 degrees of the set temperature. Finally, when the set temperature is reached, the LCD background will turn red – the receiver will also beep. The receiver is splash proof and comes with a pullout counter top stand, and the transmitter has a wire that can be used as a stand or hooked to something. For added durability, both the transmitter and receiver come with rubber sleeve cases. 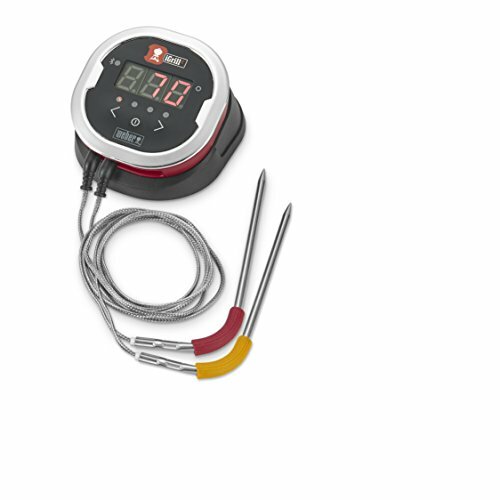 The iGrill 2 is Weber’s wireless thermometer. While it allows you to connect and monitor four probes at once, it only comes with two probes. Still, this could be a great choice for you if you need to monitor more than two pieces of meat at once. Like the Tenergy thermometer in the #2 spot above, the iGrill2 takes advantages of Bluetooth technology for connectivity. You will have to download the Weber iGrill app on your smart device, and it’s available for Android and Apple. Like the first three thermometers in this list, the app has a library of preset temperatures for different meats, or you can enter a custom target temperature. One unique feature offered by the app is temperature graphing over time. You even have the ability to export temperature graph data. And when your food has reached the set temperature, you will get a notification on your phone. One potential negative regarding this thermometer is the Bluetooth range. It will not allow you to check temperatures from hundreds of feet away like the ThermoPro thermometers in this list. If long wireless range is important to you, this probably isn’t the best choice. Note that batteries are included with the Weber iGrill 2, and it provides an impressive 200-hour battery life. Unlike all the other thermometers on our list, this Mister Chefer digital thermometer is not wireless. It won’t let you continually track your meat’s temperature from a distance, but it certainly has its place. If you don’t mind walking out to your smoker and taking a temperature, this thermometer can provide a great value. One advantage of this instant read thermometer is that it’s super simple to use. You won’t have to deal with multiple pieces of equipment or downloading an app. Just stick the probe in your meat and get a temperature reading within 1° F of accuracy in 2 – 3 seconds. If you need to switch between Fahrenheit and Celsius, just push the dedicated button. This thermometer is waterproof, so you can wash it without worrying about damaging it. It also has a strong ABS plastic body, so dropping it won’t do any harm. And it has a backlight, so you’ll have no problem using it in the dark. This model is built with a magnet inside, so you can stick it on your refrigerator when you’re not using it. It also has a hole on one end, so you can hang it on a hook if that’s more convenient. Also, its probe folds in to save space. 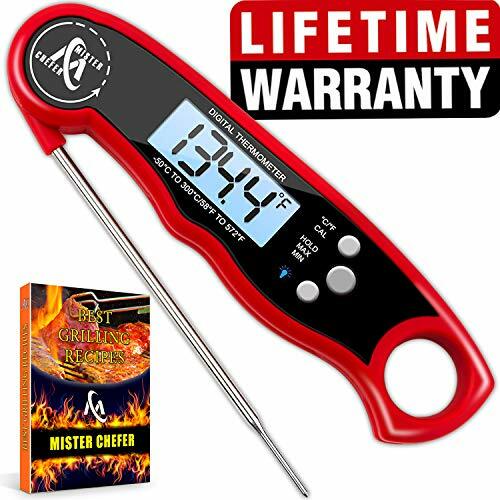 Last but not least, Mister Chefer offers a lifetime warranty with this thermometer. The ThermoPro TP20 is our overall best smoker thermometer. It provides great range and accuracy, and two probes is a good number for most people. However, if you just need one probe, the TP07 is a similar thermometer with a single probe. 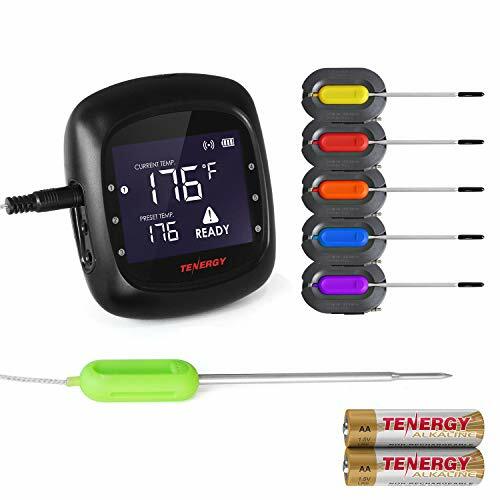 The Tenergy and Weber Bluetooth thermometers offer higher probe capacity (6 and 4, respectively), but their wireless range is less than the ThermoPro models on this list. The Mister Chefer instant read digital thermometer is a good choice if you value simplicity and ease of use. I hope this article was useful for you. If you have tips/suggestions of your own – or any other questions or comments – please leave them below!